Is your current aircon system letting you down? Contact the JC Air Conditioning Installation team located in Sydney for everything AC related. No matter the issue we have you covered! From Services, replacements, maintenance to new Air Conditioner Installations you have landed at the right place. Our team of great tradies installs systems ranging from single room wall hung split units to keep your bedroom cool on those hot summer nights, to commercial VRF/VRV & Hybrid systems. Old school workmanship that has you covered no matter the issue! Let us contact you & organise your FREE in-home quote. We commit to answering every service & maintenance call no matter the priority, with the same level of urgency as we know an AC problem in Waterloo NSW can mean a day or possibly weeks of pain and inconvenience. Beginning the journey towards a new Air Conditioning system may be quite daunting. What if the contractor does a bad job? What if you get hit with extra charges after the job is finished? What if they take my money and do not deliver? Wall hung splits a great option for those wanting the comfort of aircon in a certain area of the house or if you are sticking to a budget. Also a fantastic option for apartment’s located in Waterloo where ducted air conditioning may not be an option. If you are looking for the new range of split system air conditioner solutions, Daikin have you covered with purifying filters that ensure fresh, conditioned air flow with more efficiencies then ever and the most energy efficient split system yet. Split System Air Conditioning may be substantially cheaper than a complete ducted system however if you are just wanting to heat or cool a certain area we can install a split unit starting from prices as low as $1499. The top advantage of a refrigerated ducted reverse cycle air conditioning system is that it is effective, aesthetically pleasing and allows you to take total control of your indoor climate. If you are after value for money, ducted aircon is the way to go if you compare the area you need to condition to their cost. 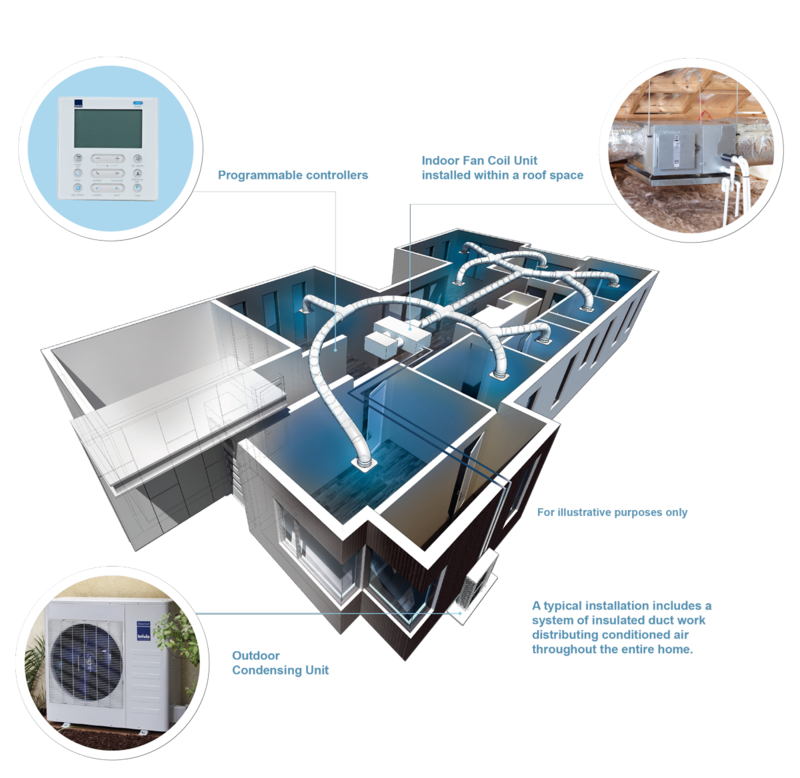 Here at JC Air Conditioning Installations, we are proud to be one of Sydney’s specialist group of Daikin Air Conditioning Systems. JCAIR have been business partners with Daikin for 5+ years and we are proud to call them our main supplier. We offer a wide range of all their products from Daikin Split system air conditioners to Daikin Ducted Air Conditioning systems and everything in-between. As we are an authorized Daikin dealer with we are perfectly placed to answer questions about any Daikin air conditioning system you may have. All our team members are well versed on all products, knowing the ins and outs and happy to pass the knowledge on. Daikin is 100% focused on just air conditioning which gives them an edge over the competition. They are renowned in the industry as one of the aircon manufactures in the business and this dedication is what we admire so much and the reason we work with Daikin on a day to day schedule. We realize you are investing in your future for your home and business when looking to purchase an air conditioning system. There are many things to consider such as what type of aircon unit; split, multi-split or ducted then the quality, efficiency, installation cost, and durability. The Toshiba range tick all these boxes and produce fantastic air conditioners no matter the budget, system requirements and customer desires. Over at JC Air Conditioning, our team have in-depth knowledge of all the Panasonic systems, we are able to take the designs of your house mixed with your needs and desires and incorporate a Panasonic air conditioner to fit. The Samsung range offers a range of highly efficient systems with the highest energy efficient ratings in the industry. The JCAIR team love this about Samsung as the savings are passed onto you in energy costs over the lifetime of the install. We strive on bringing the best air conditioning systems and solutions to Waterloo. As our long history states, we have demonstrated our commitments to the community providing these top of the line systems and Fujitsu helps us achieve that goal. JC Air Conditioning Installation is regarded as one of the leading AC install contractors in NSW for ducted aircon. In recent years Ducted systems have grown in popularity as the prices have decreased dramatically while increasing unit efficiency, making them more cost effective for heating & cooling your entire home. Call us today at (02) 8599 4546 to discuss your needs and to schedule immediate service. You will always be greeted by a friendly professional! If you wish to find out more about Waterloo Click Here and Learn More about the local area we service. Take a look at our client reviews to see what your neighbors are saying about our work, and decide for yourself if we are the right Air Conditioning company for your needs. Click Here to view the other suburbs we service.